It was the perfect place to dive. The obvious choice. 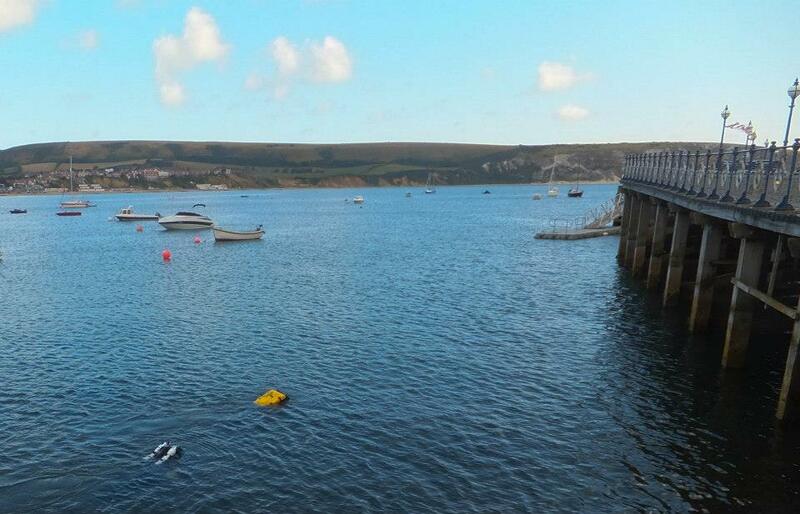 Back in 1992, my debut sea dive was underneath Dorset’s Swanage Pier as I cautiously made my first ever night dive. A day later my first ever wreck dive was out of Swanage. 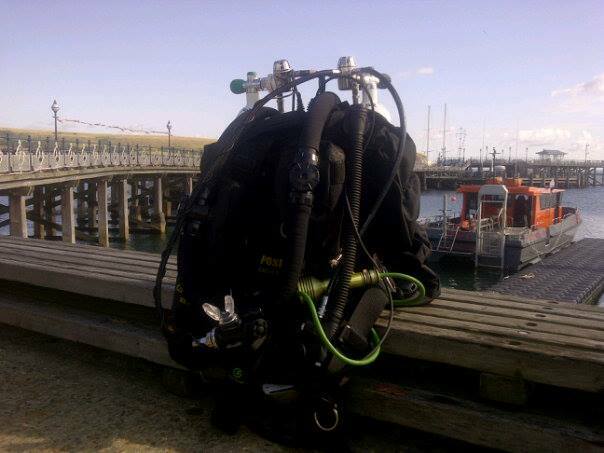 So when a couple of friends hatched a plan to take me on my first UK sea dive on my Poseidon rebreather; the ideal solution was of course Swanage! Swanage is actually quite useful as a ‘first sea dive’. You can take a dip beneath the magnificent Victorian Pier to ensure your weighting and buoyancy are correct, before doing something more adventurous. We duly walked down the wide stone steps and did pre dive checks before gingerly stepping over, on and around the submerged rocks. Experience is a good teacher. You quickly learn how to minimise risk to yourself and your kit. 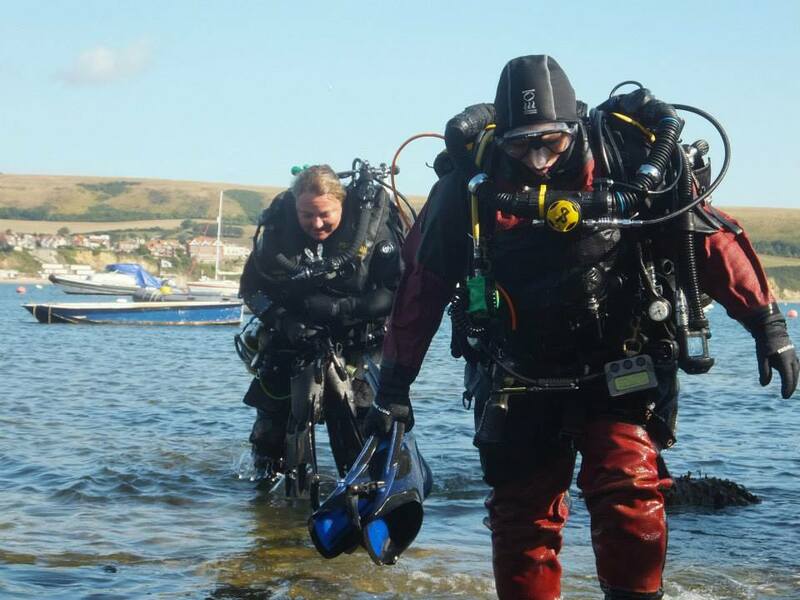 Walking into deeper water at Swanage is not that easy and there is a high chance you can fall over and hurt yourself or damage your equipment. As soon as we could, we gently dropped onto our knees and used ‘pull and glide’ techniques to get us into deeper water, where we could make a proper descent beneath the pier. After a quick non-descent (yes please I do need another 2 kilos), we gently dropped beneath the Pier. It looked to me as though the seabed was covered in tossed Marks & Spencer salad being gently washed about by the current. There was a good smattering of Sea Lettuce wafting in the water. I played with my buoyancy whilst watching a feisty Velvet Crab demand that I take it on. One of the things I really love about my Poseidon is how quickly I can get to grips with my buoyancy and get a reasonable position in the water. I have found that this skill is not so intuitive on other units. I glanced over to Lisa to check she was ok, to find her picking up a disc from the seabed. I inspected her outstretched palm closely. Tuppence. And then I spotted one too. We cruised the seabed, giggling as we found more coins. It was a useful drill because we were diving 3 metres / 10 foot. 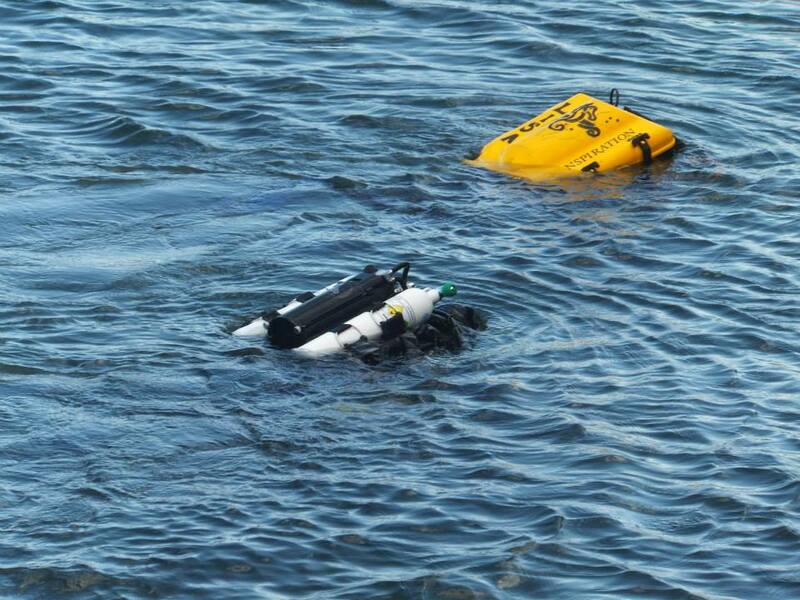 If you can achieve and maintain neutral buoyancy here, then you are in good shape for deeper dives. All too soon it is time to turn for home and head back. I surfaced triumphant gleefully clutching three tuppences. Treasure worth 6 pence. After a reasonable surface interval debriefing, dive planning and enjoying ice-cream, we jump on a boat to head out to the SS Kyarra. Time to kill some ghosts. Why the “ghost killing”? There are certain dives that are forever seared into your soul for good, or not so good reasons. My first dive after I had qualified as a diver was a “not so good dive”. 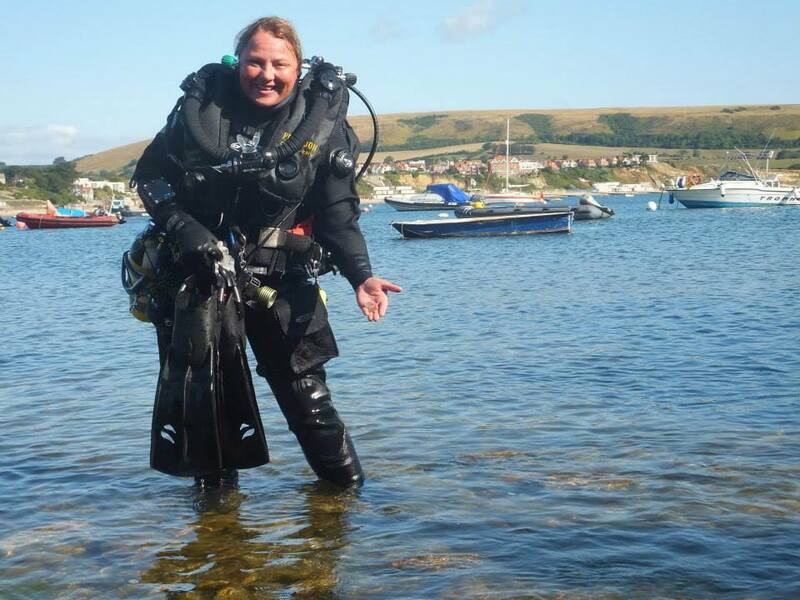 I did my four PADI Open Water dives in Stoney Cove, and a few weeks later my five PADI Open Water Advanced dives out of Swanage. After listening to some very bad advice from an instructor, and not realising at the time it was; my first ever dive, as a qualified diver, was the SS Kyarra. She is considered a classic British wreck dive and she can be an awesome dive. The Kyarra is probably one of the most dived wrecks in the UK because she is so accessible from Swanage, a mere 20 minute boat ride. She was a twin-masted schooner-rigged steamer, built in the Clyde (Scotland) in 1903 and was torpedoed a mere 15 years later on 26th May 1918 by the German submarine UB-57. Today she lies in 30 metres / 100 foot. 30 metres temperate water diving off the UK south coast is a completely different animal to 30 metres blue water diving in Grand Cayman or Egypt. It can be as black as your hat down there, or the wreck can benefit from good ambient light. I have dived it in various light levels. And the wreck can be swept by quite strong currents. 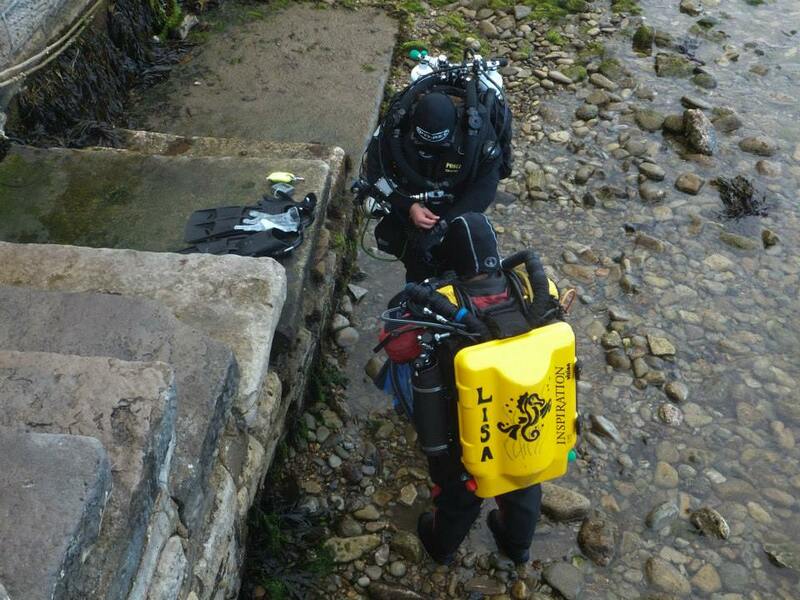 It is certainly not the place for brand new qualified divers to go exploring on their own. My 10th ever dive was with someone vastly more experienced than I. He had 14 dives. And it was back in the day when octopus’ were not mandatory kit. Between us we had a primary regulator each. And then we shared a watch, a depth gauge and the biggest knife we could lay our hands on. Long story short, after a 25 minute bottom time at 30 metres, we were off the dive tables with decompression obligations to fulfil. We didn’t. Instead we made a very fast uncontrolled ascent from seabed to surface in a matter of seconds. To this day I still do not know why either of us didn’t embolise or get decompression sickness. We were very very lucky. Twenty two years later, not quite to the day, here I am jumping on the Kyarra with my Poseidon. Time to kill the ghost of that dive. It took ages to get down the shot. 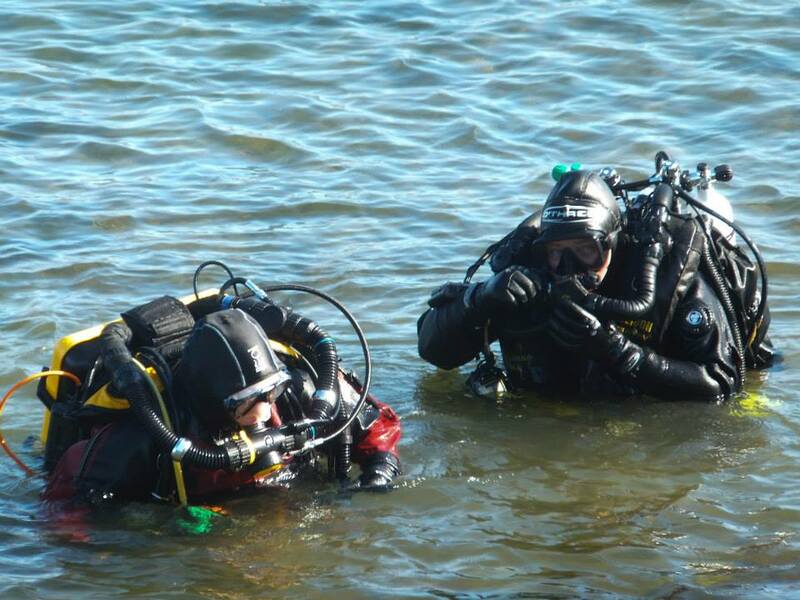 You can’t descent quite as fast on a rebreather as you can on scuba. The viz was a tad milky and I wondered just how dark it would be on the wreck. We got lucky! The wreck was bathed in glorious emerald green light and the viz was pretty amazing. Ten metres plus. We both confirmed we were “ok” and started to bimble along the wreck. An opening looked quite enticing. I could see it didn’t go very far, something like two metres, but I was still curious. There was nothing of interest, however I got a little stuck. What immediately went through my mind was, “I have all the time in the world to get out of here.” My Poseidon was giving me just what I needed at that moment. Time! After some gentle wiggling, I successfully reversed into the green sunshine. The wreck is pretty broken up, however you can still make out some key features on her. Pieces of deck. The cove hatchings around the holds. Bollards and some railings. Time to check my paddle and computer. 20 minutes before I hit deco, and I’d already been down there for 20 minutes. How wonderful to have the luxury of such long no-decompresion time and I marvelled at just what little gas I had used on the dive. I was snug, warm and very happy on my Poseidon. Ahead of me loomed a vast boiler. I inched closer admiring the ‘furry’ boiler. It was covered in hydroids and small sea anemones. “Is anyone home?” I wondered. I peered in one of the fire doors expecting to come face to face with a Conger. Instead I was greeted by a blue lobster wiggling its tentacles at me. All too soon we came the end of the wreck as I hit one minute of deco. Time to dispatch my delayed surface marker buoy and head on up. I love how my time machine can allow me to do a 50 minutes run time with pretty much no deco, on a wreck at 30 metres. Pure Poseidon pleasure!